Demolition of Juba Football Stadium has started to pave way for reconstruction of South Sudan’s only recognized football stadium. The reconstruction was planned by the country’s football governing body-South Sudan Football Association (SSFA). Earlier this week the South Korean construction company, The GS Construction Company embarked on the demolition of the old Juba Football Stadium structure. The FIFA funded project, if completed, will have a capacity of 7,000 people, according to the SSFA President, Francis Amin Michael in a tweet. The project kicked off on paper last month and the construction work will take a period of eight months. “Once fully renovated, it will accommodate 7,000 people. As SSFA we are indeed glad that the dream is becoming a reality. With good infrastructure, good football will be played,” Amin tweeted on Wednesday. The news brooded mixed reactions from soccer lovers on social media. 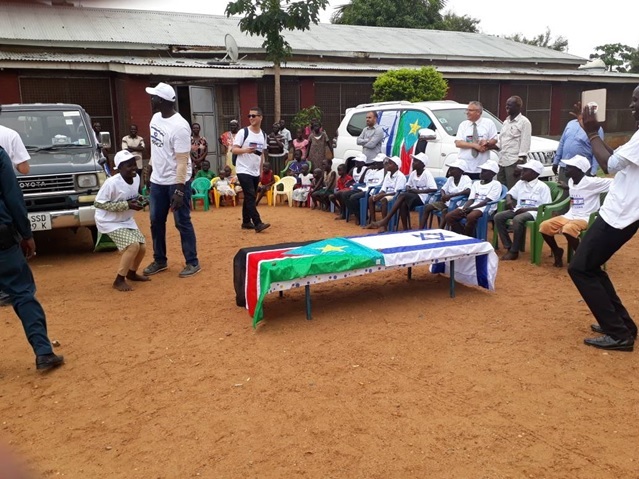 Edward Luka, The Editor – In – Chief of The South Sudan Medical Journal applauded the SSFA for taking the initiative to improve the quality of the stadium to the International Standards. “Football is a great game that will unite South Sudanese. Keep up the good job at SSFA,” the aspiring novelist wrote in a tweet replied to the SSFA President. One Atlabara staunch supporter Maya Logo could not help hold her excitement with the reconstruction of the Stadium. “This is one of my favorite hangout points in Juba. Built in 1961, Juba Stadium finally went down! We shall have a new structure in 8 months. We say thank you!” She tweeted earlier this week. Meanwhile, Francis Malwal was pessimistic about the demolition of the stadium suggesting that the SSFA should have built a new stadium and left the old one to act as history. Juba Stadium has in the past faced criticism from different countries during international matches over its poor structure. The pitch has prevented the players like the Arsenal’s striker and Gabon International Pierre-Emerick Aubameyang from traveling to Juba South Sudan for the African Cup of Nations 2019 qualifier against The Bright Stars in September last year. Saido Berahino, who plays as a striker for English Championship club Stoke City and the Burundi national team also complained about the quality of the pitch after he failed to shine during Burundi’s visit to Juba last year. The most recent complain came from the Tunisian U-23 head coach, Fraid Binjuasam during their clash with the Junior Bright Stars in AFCON 2019 and Tokyo 2020 qualifiers in Juba on the 20th of March this year. He complained bitterly of the playground saying the rough playground distracted both teams from playing to the best of their abilities. “The football pitch denied both teams the opportunity to play entertaining football,” Fraid said. In the wake to improve the standard of the country’s football pitch, the SSFA and FIFA earlier this year launched the 6 million US Dollars project to renovate the stadium. FIFA Member Associations and Development Director for Africa and the Caribbean Region, Véron Mosengo-Omba acknowledged that the project would prove to be very important for South Sudan’s football development.